Sales and Sales alone. We specialise in the sale of property in the Burnley and Pendle area. Lettings?. We leave that speciality to Agents who have the time to devote to the demands that type of Business requires. We remain confident that if you speak to people who have experienced our service, they will confirm our greatest strength is our people. Operating from our prominent Town Centre premises in Manchester Road, the team are hand-picked, are local and experienced in the sale of property. We know every inch of the areas we cover, throughout the Burnley and Pendle region, and take pride in our local knowledge. Small enough to care, substantial enough to meet your expectations, unlike other Agents, you're likely to see the same familiar faces every time you come to sell. Experienced in property transactions for over 80 years, we know how our Business ticks, and how to sell in every conceivable market conditions. Negative comment on the property market is abundant, though you won't find that here. What you will find is an honest assessment, a balanced opinion which puts you in the driving seat advising the correct path to take. We have a keen eye for detail, spending time and effort creating quality marketing materials because first impressions count. When it comes to selling, our sales particulars are a thing of envy. We are positive in the language we use on paper, but you will never find the content misleading. We boast professional-quality photographs, with the option to include as many photographs as required. These photographs, accompanied by accurate text and measurements, are produced by people who are qualified in their field. Designed, packaged and printed in-house, this allows your property to be brought to the market far quicker than elsewhere, all of which is included within our online marketing, through Rightmove. The fact that over 85% of potential buyers begin their search online, we recognise the popularity of Rightmove and how to exploit this channel of marketing. Boasting popularity in the top ten of all websites viewed, and with a 58% market share, that's six times more than the next nearest competitor. Some may argue that all agents now subscribe to Rightmove. 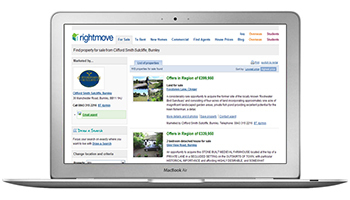 In this instance therefore, it becomes not just about being on Rightmove, but the quality of information provided. This is where we feel we differ from that crowd. All the information we provide on a set of sales particulars is available electronically, have a look for yourself and compare. Because of this, we boast a click-through rate of almost twice the local average, meaning you are twice as likely to attract a potential purchaser with Clifford Smith Sutcliffe. Finally, we remain committed to the more traditional marketing in the local press. We have a regular two page presence in the Burnley Express, listing the property we have for sale when going to press. You won't however, find full pages of bold corporate advertising, special seasonal sale campaigns or a list of properties we have already sold and is therefore no longer of interest to you. Just good, honest photos, text and prices, oh and a phone number to arrange a viewing! 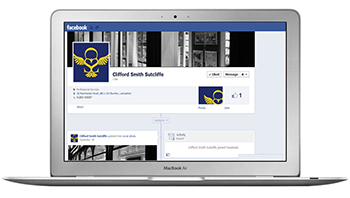 ...and if that's not enough to digest, find us on Facebook and Twitter for regular news and updates.